1. Preheat the oven to 200˚C, gas mark 6. Whizz the peppercorns, garlic, ginger and chilli in a small food processor until finely chopped. Add the tomato purée, honey, soy sauce, sunflower oil, salt and 2 tbsp cold water; whizz to a loose paste. 2. 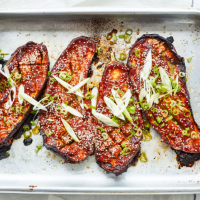 Halve the aubergines lengthways, then deeply score in a criss-cross pattern, taking care not to cut through the skin. Put in a roasting tin, then spoon over the paste, pushing it into the incisions. Cover with foil and roast for 30 minutes. 3. Remove the foil, scatter over the sesame seeds and roast uncovered for a further 30 minutes, until very tender and browned. Drizzle with the sesame oil, rest for 5 minutes, then scatter over the salad onions and serve.